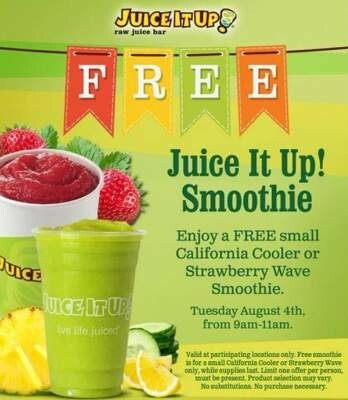 IRVINE, California – Juice It Up!, one of the nation’s leading raw juice bar and hand-crafted smoothie franchises, is celebrating 20 refreshing years by offering guests a free smoothie at the chain’s more than 80 units nationwide. On Tuesday, August 4, between 9 and 11 a.m., head to Juice It Up! to receive a complimentary small Strawberry Wave™ or the new California Cooler™ smoothie, with no purchase necessary. Applebee’s is offering a free meal to active and retired members of the US Military on Veterans Day. Click here for details. They have locations in the OC in La Habra, Fountain Valley, and Santa Ana. Click here for location details. Black Angus Steakhouse is offering a free appetizer to active and retired members of the US Military, on Veterans Day. Click here to find a location. They have locations in Orange County in Buena Park, Fountain Valley and Santa Ana. California Pizza Kitchen is offering a free entrée on Veterans Day for current and retired members of the US Military. They have locations in the OC in Anaheim, Brea, Huntington Beach, Irvine, Newport Beach, Santa Ana, Seal Beach and Tustin. Click here for location details. El Torito is offering a 20% Military discount for all veterans and military personnel that show valid ID. They have OC locations in Anaheim, Buena Park, Cypress, Fullerton, Irvine, Orange, Placentia, Tustin and Westminster. Knott’s Berry Farm is offering free admission to active and retired members of the U.S. Military from November 2, 2014 through January 4, 2015. Up to six additional tickets may be purchased at Knott’s Ticket Booths for only $24 each from November 2 -21 and for $29 each November 22 through January 4, 2015. Military personnel may also purchase additional tickets at a participating local Military ticket office. U.S. veterans, retired and active military personnel must present military ID or proof of U.S. military service at Knott’s ticket booths to receive the complimentary tribute tickets. 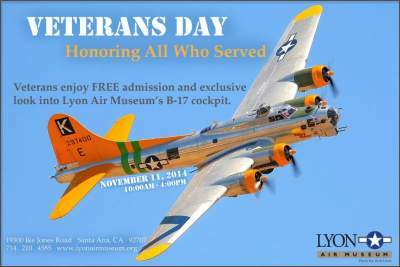 Veteran, retired and active military personnel must be present. The Totally 80’s Bar & Grille, a casual dining environment based around an all 1980’s theme and serving unique and delicious comfort food, is celebrating their Grand Opening on Saturday, September 13, 2014, starting at 5 pm, at 2512 W. Orangethorpe Ave., in Fullerton. Owner Jenny Chai, General Manager Andrew Do, and District Representative Joy Kim commemorate the grand opening of Mr. BBQ. To congratulate Mr. BBQ on its grand opening, the Fullerton Chamber of Commerce hosted a ribbon cutting ceremony on July 11. Mayor Doug Chaffee, representatives from local elected offices, and other small business owners joined to congratulate owner Jenny Chai on the success of her new business. Freeway, exit E Chapman Ave.
Fullerton is the 12th location for 85°C Bakery Cafe, and also the 4th location in Orange County. This year they have opened locations including a 2nd location in Northern California. Interested in activism? Veteran of the liberty movement? Come by the Liberty Activist Meetup at Angelo’s & Vinci’s Ristorante, in Fullerton, at 550 N. Harbor Blvd., in Fullerton, on Friday, Oct. 4, 2013, at 7 pm. This is a Liberty on the Rocks event. Where to watch the Mayweather vs. Alvarez fight in Fullerton tonight! The pay-per-view sales record is 2.5 million buys, for Mayweather versus De La Hoya, 2007. Mayweather-Alvarez has a decent chance to beat that record and almost certainly will top Mayweather-De La Hoya in revenue, because the price Saturday is $64.95 ($74.95 for high definition). That’s $15 to $25 higher than the ’07 price, according to the L.A. Times.